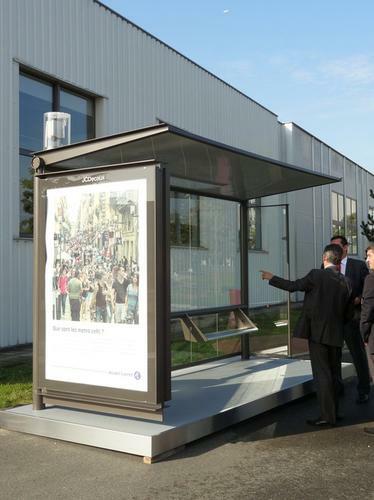 Alcatel-Lucent and JC Decaux are working together to integrate wireless connectivity with street furniture such as this bus shelter shown at Alcatel Lucent's Bell Labs Future X Days exhibition near Paris on Sept. 30, 2014. There will be nearly 1.37 billion 4G LTE subscribers around the world by year-end, up from nearly 650 million in 2014, according to market research company ABI Research. LTE's growing popularity is helped by a number of things: mobile operators including the technology in more of their plans, cheaper LTE smartphones and aggressive network expansions in countries like China. LTE is being rapidly embraced in North America, Japan and South Korea where it'll be included in a majority of subscriptions this year, according to telecommunications equipment maker Ericsson, which last week published a report on its expectations for future mobile growth. In countries where LTE adoption is high, network operators are looking for new ways to keep their networks from buckling under the growing weight of traffic, especially video, buoyed by the growing popularity of smartphones with big screens. Operators will rely on small cells to keep data rates up in places where networks are congested. For example, Verizon Wireless is partnering with Ericsson to deploy small cells, with nearly US$500 million allocated, according to ABI. As the name hints, small cells are tiny versions of traditional base stations, and only cover a limited area. The concept isn't new, having been used to upgrade networks built on previous technologies, but its deployment in LTE networks has been hampered by operators struggling with where to install small cells, how to manage them and how to integrate the equipment with the rest of their networks. Ericsson is far from the only company that's been working to sort out these issues. On Tuesday, Alcatel-Lucent announced an expansion of its Site Certification Program, which helps operators find places where small cells can be installed. The popularity of LTE will continue to grow over the next 5 years at an average rate of about 20 percent, exceeding 3.5 billion by 2020, according to ABI Research. Ericsson is a bit more optimistic in its predictions about LTE's future growth, saying that there will be 3.7 billion subscriptions by 2020 in a report published last week. By 2020, LTE will totally dominate in the U.S. and Western Europe. Globally, 3G networks will with around 3.8 billion subscriptions still be more more popular, Ericsson said. The year 2020 will also be significant for another reason; the first 5G networks are expected to go live in countries such as Japan and South Korea.